Texas Pete buffalo wing sauce has been sitting in my pantry for the past couple of months untouched. I wanted to do wings then I changed my mind. Then I switched to mac and cheese with the sauce. Nope, changed my mind again. The past couple of weeks buffalo chicken bites have been plastered all over my Pinterest wall. People love these bites and I was determined to try them as well. Shoot ~ I even had the sauce in my pantry. One of the recipes that I found on Pinterest was from Sweet Pea’s Kitchen. I made a few minor changes to the original recipe. This would be a great appetizer for the Superbowl Game or any get together. In large bowl add the chicken, sauce, both cheeses, and the ranch package. Stir with a spoon so that everything is well coated. With the same spoon or with an ice cream scooper make small round balls. Mixture may seem sticky but that’s ok. Place all of the balls onto a plate. Divide the eggs, panko, and flour into three small dishes lined up next to each other. 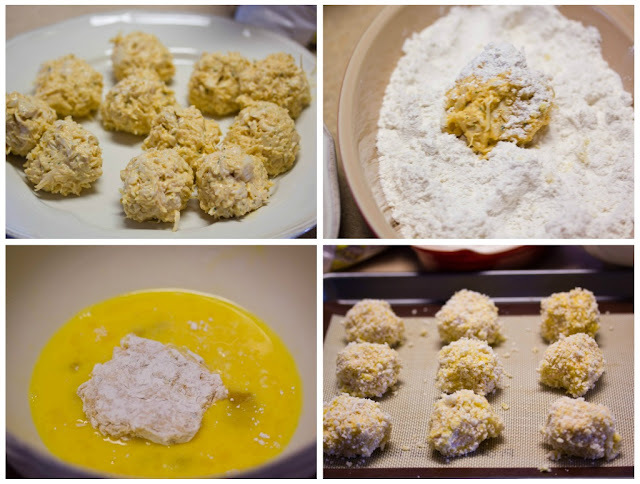 Place the balls one at a time into the flour, eggs, and panko mixture in that order. Put the balls on a baking sheet or silicone mat. Cook for 20 – 23 minutes. Serve with ranch or blue cheese dressing.